By his second semester on the job in 2009, Eric Nelson, a civics and history teacher at North Lakes Academy in the Minneapolis suburbs, was at a loss. No matter what tool he used -- gripping news articles, an interactive map of YouTube trending videos, a failed-state index -- he couldn't manage to keep his students interested in world events for any extended period of time. "They were just zombies," he recalls. Nelson's is a common tale. Multiple studies have documented the growing trend of apathy among young Americans toward world events. A National Geographic survey, for instance, found that only 37 percent of young people (18-24) could locate Iraq on a map; 48 percent think that Islam is the predominant religion in India (it's Hinduism); and 20 percent place Sudan in Asia (it's the largest country in Africa). Throwing up his hands in frustration one day, Nelson turned to his online fantasy football league for a distraction. Instead, what he found was inspiration. Realizing how much he was learning about the NFL in the process of managing his fantasy team, he thought: What if I applied the mechanisms and tools used in fantasy sports to world events? "The next day I went in and [the class] drafted countries," he recalls, "and I scored them based on how many times they were mentioned in the news." And thus Fantasy Geopolitics, an online tool to engage students in world events, was born. As it turns out, Nelson isn't the first to gamify current events in this manner, but he has been the most successful. In the past several years, short-lived communities for handicapping Supreme Court decisions and congressional movements have sprung up at universities or as one-off projects. But Fantasy Geopolitics is the only such program designed with classroom learning in mind. The tool Nelson has created is robust enough to react to news in real time, yet simple enough for the average sixth- to 12th-grader to use. "Fantasy football sets the standard of fantasy sports," he says, "I believe Fantasy Geopolitics sets the standard for fantasy learning." It's a big claim, but the program has already seen rapid growth. Within a month of his initial idea, Nelson couldn't keep up with scoring the news manually, so he contracted developer friends to automate the system. And now, what began as a Google spreadsheet has become a full-blown software-as-a-service network. In the winter of 2014, he formally launched the platform online and began raising funds through Kickstarter. Today, some 50,000 students and more than 1,000 teachers are using Fantasy Geopolitics as part of their history, civics and world-events curriculum. The basics of the game are simple: Teachers sign up, create a league and invite their students to join. Students select countries during a web-based draft, and earn points based on how their territories are performing in the news. Nelson and his developers created software that monitors The New York Times website for names of countries. Every time a nation is mentioned, the student who owns that country receives a point. So, in essence, a story about Croatia has the same value as a quarterback passing for a touchdown. 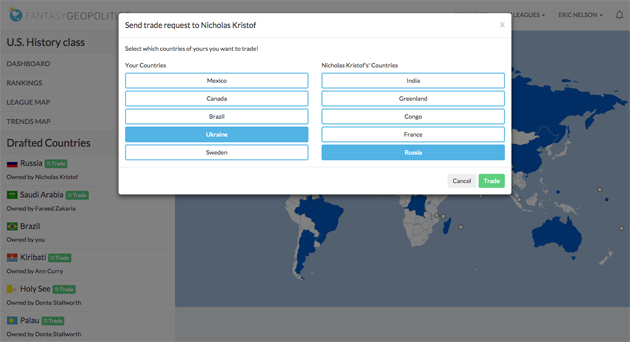 The Fantasy Geopolitics website uses the tracking scripts Nelson and his developers created to populate live maps and leaderboards automatically. 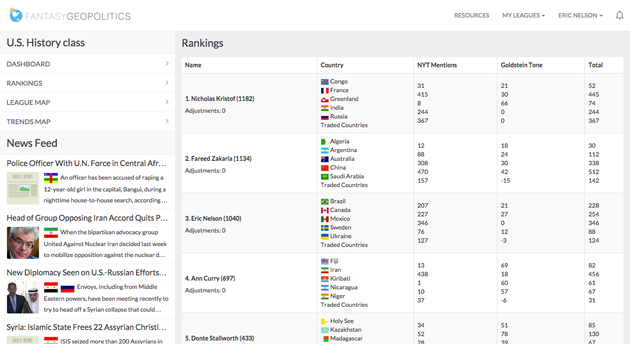 Dashboard view includes rankings, messages and a news feed. Version 2.0 launched in mid-August. In addition to being optimized for mobile devices, where Nelson says many students track their teams and news, the update brings with it many user-experience improvements. 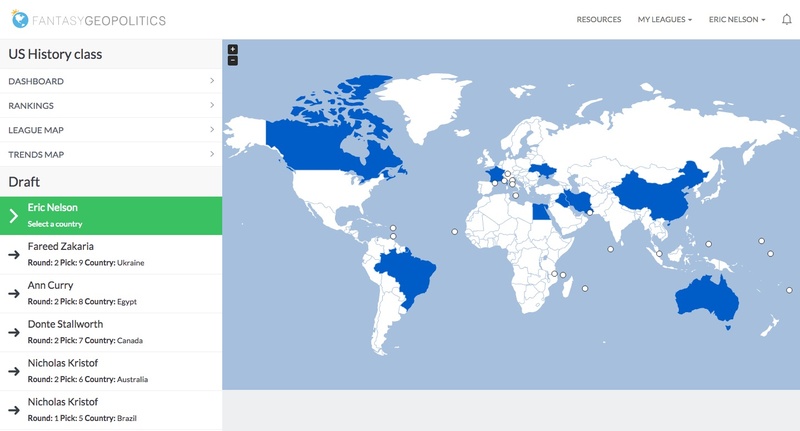 The new Fantasy Geopolitics dashboard includes tools for trading teams, current rankings of the top news-making countries, and a map that color-codes countries based on their current trending status. Pricing for the current school year varies based on league size: The free starter plan allows for up to five players; 100 players costs $99 a year and 250 runs at $198. 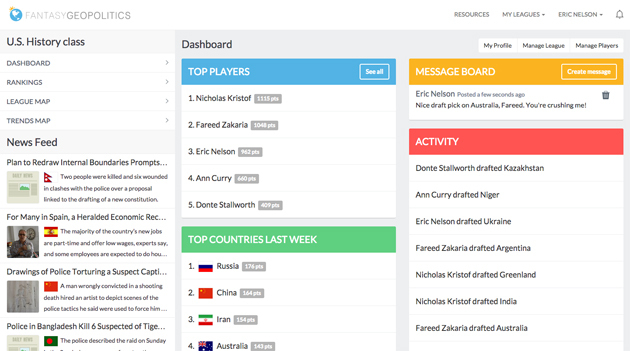 According to Nelson, the updates help Fantasy Geopolitics become even more like fantasy sports league dashboards, which are rich in information and context. "I got so into [fantasy football] because there was all this information available about what was happening -- the player updates and team updates," he says. "That can exist here; we just call it news. You can engage with news and interact with it a little more fully. And then if you can adjust your lineup, you compete better." 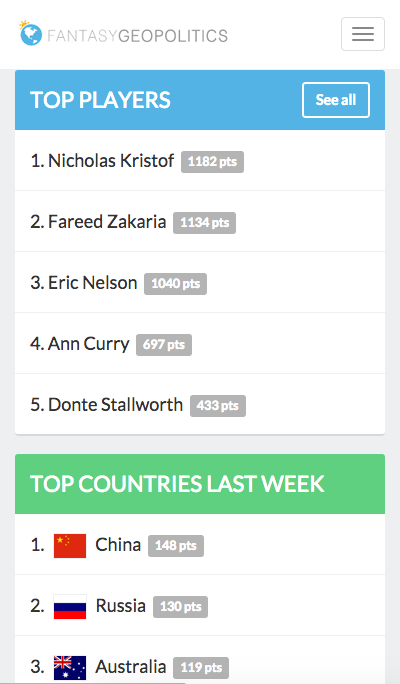 The leaderboard shows who's on top and what countries they own. To stay sharp throughout the season, students must closely monitor news about the countries they own, while also keeping an eye on others that might be targets for potential trades. "I discovered that students were actually starting to really study the news to gain a competitive edge from week to week over their peers," says Gerald Huesken Jr., a teacher of history and government at Elizabethtown Area High School in Elizabethtown, Pennsylvania, who's been using Fantasy Geopolitics in his classroom. Huesken, Nelson and many other teachers report that students are even taking the game to their own channels, such as Facebook groups and Twitter lists. "They started a Facebook group to talk about the game a little bit," Nelson recalls, "They were trash talking each other on there, but in a smart, informed way, which is super cool. It seemed to be more in their zone, their zone for learning." Indeed, the idea of the "zone," applies to teaching as much as it does to sports. In fact, so-called competitive fandom has been shown to facilitate learning. A study conducted by researchers at the University of Wisconsin-Madison, for example, explored how online fantasy baseball-like programs could lead to more-impactful learning experiences in other fields. The authors posited that a goal-based system (one in which you want to earn points and win) encourages players to engage with a large body of content (e.g., news, analysis and statistics) and use that knowledge to their competitive advantage. Though it's still too early to quantify just how much Fantasy Geopolitics can improve academic performance, there's more than enough anecdotal evidence to prove its worth. Nelson, for instance, says he's noticed an uptick in test scores. Meanwhile, Huesken was pleased to see students in his history classes making connections between historical details and current events in papers and on tests. At the very least, it helps trap wandering minds: "I often use [it] during prom season," says Stephanie Pearson, head of the Contemporary Studies Department at Holy Trinity Catholic High School in Ontario, Canada. "It's a sly way to keep students on task." Nelson has seen enough to feel confident that his platform has the makings of a powerful learning tool, and so has left teaching to pursue expanding the business and building out the platform even further. Some of the first updates will be simple; the team is starting to roll out an embedded messaging tool, for example, and they're planning to bake in the ability to set up playoffs and tournaments. But Nelson's vision is more global than that -- literally. Heeding feedback from teachers like Huesken, the site will soon allow for inter-school competitions, which could let leagues across the world from one another compete and collaborate. (There are already teachers using the platform as far away as Spain and Australia.) These collaborations could allow Fantasy Geopolitics developers to format the games around world events, such as the Olympics, and integrate more deeply with videoconferencing tools like Skype and Google Hangouts. An app is also in the works, but Nelson first wants to focus on adapting the tools he's built for other civics and social-studies lessons. For instance, he's considering developing a US edition for the 2016 presidential election, which will help better convey the Electoral College and process. Regardless of the subject matter, Nelson believes the software has the unique ability to empower students in the learning process. "Rather than me being the source of knowledge, my students manage their own learning, just like they manage their team," he explains. "[Fantasy Geopolitics] encourages a reimagining of the way learning and curiosity actually works -- a student now owns it, and manages it, and wants to do it."